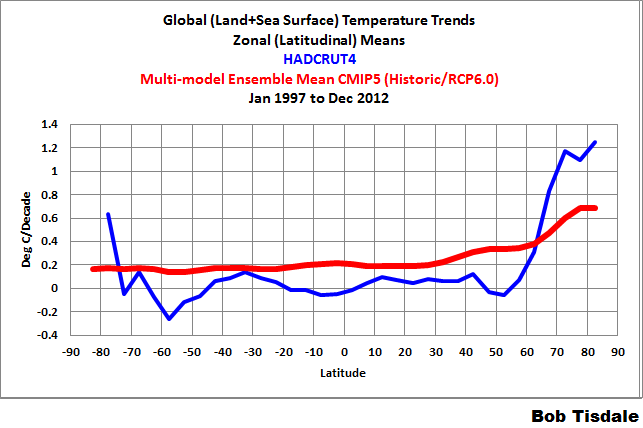 The HADCRUT4 data and the climate model outputs are available through the KNMI Climate Explorer. 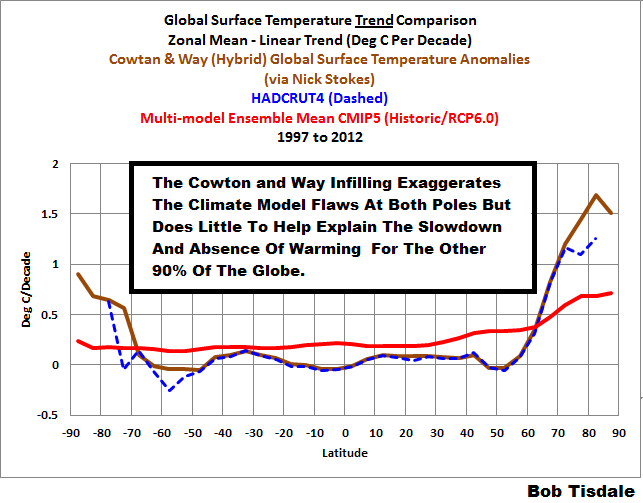 This entry was posted in CAGW Proponent Arguments, Climate Model Failings, Climate Model Problems, HADCRUT4. Bookmark the permalink. It would be interesting and perhaps informative to see the Figure 2 plotted in an “equal area” zonal plot. By that, I mean that the x-axis spacing is sin(latitude). This would make the x-axis distance filled by each latitude band proportional to the area in that latitude band. This type of plot would further emphasize the spikes in trends near the north and south poles. charliexyz, wouldn’t it be better to weight the trends by latitude? That would deemphasize the poles, which would be appropriate since they do represent so little of the globe. I agree that it would be better to weight the graph of trends by the area at each latitude, by making the spacing of the x-axis proportional to the area at each latitude. Doing this should make the distance between S90 and S80 (and N80 to N90) the smallest spacing between 10 degree bands. The x-axis spacing between 10South and the equator (or equator and 10N) is the largest, and then the plot gets compressed in the x-axis again as it heads towards 90 North. In this sort of “area normalized” plot the global average trend would be the average of the area under the curve of the plot. I think was are saying the same thing, but just using different words. 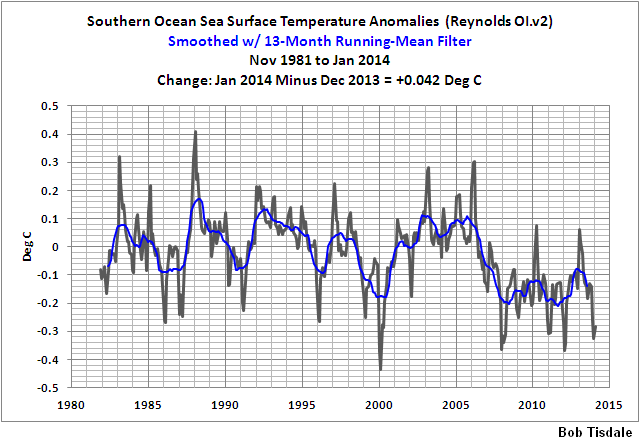 Pingback: New Paper Confirms the Hiatus Is Not Occurring at the Poles, Undermining the Efforts of Cowtan and Way | Watts Up With That?